How does a beauty industry veteran, who has eyeshadows named after her by the Sephora Pro Artist team, go from creating whimsical and charming collaborations for Sephora Collection (you may have heard of some of them: Karen Walker, Mara Hoffman, Pinrose, Jeremy Scott for Moschino, etc. ), to starting her own vegan and completely sustainable makeup line? The Sunday Issue talked with Tiila Abbitt, Āether Beauty Founder, a new beauty brand (it launched on June 21st - the Summer Solstice) at aetherbeautyco.com, and she shared her journey from artist to product developer to beauty startup founder. Read more about Tiila’s journey - the makeup game just got a bit more magical! The Sunday Issue: How did you get started in the beauty industry? Tiila Abbitt: My background was actually in fashion design. I moved to San Francisco 14 years ago to get my MFA in Fashion Design. My undergrad degree is a BFA in Sculpture, with a minor in women’s art history so, as you can guess, I’m an incredibly visual person. I can immediately look at something and know what is working, what isn’t working and know how to push the boundaries to make it better. The Sunday Issue: Were you always obsessed with beauty products and the industry? Tiila Abbitt: When I started my beauty career, I barely wore tinted moisturizer but I knew how to make a product - from ideation to in-store launch. I was thrown into developing makeup formulations and had to roll up my sleeves, dive in and learn from some of the best people in the industry, while adhering to incredibly tight timelines with many cross-functionals and “higher up’s” involved. I have always loved telling a story with product and building a brand. Storytelling is so incredibly important; all the attention to detail is needed to truly understand your customer's needs and wants. You connect with your client through storytelling and branding and that, in itself, is so incredibly powerful and so incredibly necessary in these days of beauty brands launching every other day. The Sunday Issue: Tell us about the beauty launches you worked on at Sephora? Tiila Abbitt: At Sephora, I was responsible for the design and development of all the makeup accessories: makeup brushes, eyelash curlers, eyelashes, makeup bags, sharpeners - basically all the tools of the trade for their private label brand, Sephora Collection. I was also in charge of all of their makeup collaborations for anything that said “a brand” + Sephora. I won over 19 industry awards for products I developed at Sephora over the years but I am most proud of the Sephora Pro products- like the eyeshadow palettes and the Moschino launch. The Sunday Issue: You left your job at Sephora, one tons of people dream of having, to create your own brand, Āether Beauty. What sparked this desire? Tiila Abbitt: I have always been passionate about the organic and clean beauty space. I have been a vegetarian since I was 14 and recently became vegan in January. Given that what we put on our skin ends up in our bloodstream, I wanted all products that I use on and in my body to be safe and non-toxic. I saw what other brands were doing in this space and it lacked color and trends and I wanted to bring some creativeness to the clean beauty space. I have always been obsessed with ingredients. It started because I had to learn how to cook because my mother had no idea what to cook for me when I became a vegetarian. Finding the newest ingredient was always one of my favorite things to do- in both food and beauty. I worked in an organic restaurant during college and was cooking with quinoa before it ever became a household staple. I also love the wellness space and have an affinity for space and the mystic world. One of my first memories is my dad showing me the constellations. I also wanted to create a brand that helps empower women. There’s a TON of power in beauty that I never realized until I worked at Sephora. Beauty has the power to transform anyone and, theoretically, give them a shield and a boost in self-esteem to be able to go out in the world and face the day. I think anything that helps people be their best, and actually believe it, is an amazing tool. I wanted to create a brand that makes people feel good when purchasing - not only from an ingredient, packaging and planet perspective but also from a personal empowerment and cosmic space. I believe empowerment comes through trusting your own power, your own gut. I want people to become ‘supercharged’ while using Aether Beauty products, hence the tagline: Supercharged Sustainable Beauty. The Sunday Issue: Āether Beauty - how did you choose the name? Tiila Abbitt: The word “Āether” is a really old word- not to be confused with Ether. Aristotle considered it the 5th element to earth, air, fire, water and in Greek mythology, Āether, is one of the primordial deities, the personification of the upper air that the Gods’ breathed. It’s basically this medievil concept of the cosmos and I wanted to create a cosmic brand. Each product is infused with a supercharged ingredient. The first Āether Beauty launch is an eyeshadow palette - all the shadows are infused with Rose Quartz powder and, not just to have a talking point about self-love and bringing love and light into your life but, because of the efficacy of rose quartz power. This ingredient helps prevent against fine lines. The Sunday Issues: I know you are launching one product at a time but can you share more about your overall brand vision? Tiila Abbitt: Right now, I’m planning two to three launches a year and there will be another product coming out on the latter half of 2018. I cannot wait for everyone to see what I have in store for 2019! I want Āether Beauty to be a sustainable beauty brand people think is cool and are proud to own. I want them to feel like they are buying something cosmic and something special, since they themselves are unique and special. There is a charity element to the brand, as well; 1% of sales will always go back to a charity related to the product. For instance, for the Rose Quartz Crystal Gemstone Palette (Āether Beauty’s first launch), we partnered with a charity around water since Rose Quartz is a water sign: The Water Project, which is a charity that provides access to clean, safe and reliable water and sanitation solutions across sub-Saharan Africa, one village at a time. Each product that Āether Beauty launches will be directly linked to a charity of one of the 5 elements. 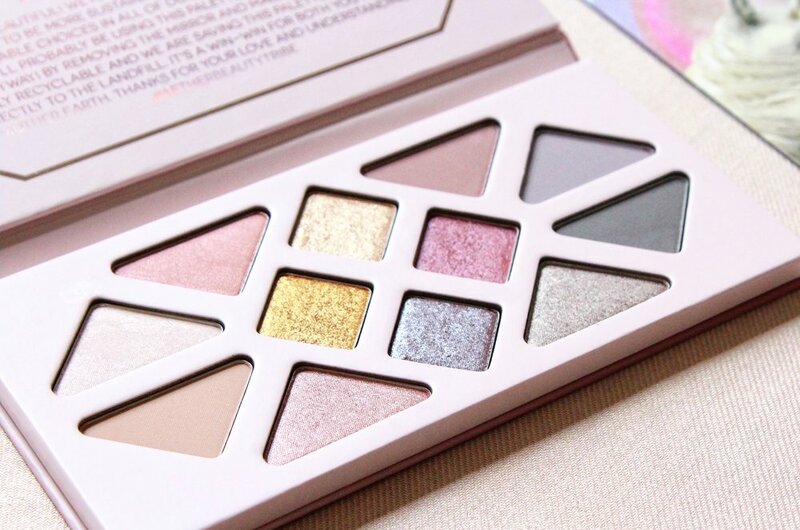 The Sunday Issue: The first Āether Beauty launch is the Rose Quartz Crystal Gemstone Palette. Eye palettes are one of the biggest trends in beauty right now. Tell us about the palette? Tiila Abbitt: The palette is 12 shades in many finishes: ultra-matte, shimmer, duo-chrome and metallic and you can create so many looks with it. The shadows are formulated with organic coconut oil and organic shea butter to create the smoothest, buttery texture that is great for one swipe application. It’s also Infused with organic rosehip oil that gives you that radiant looking, glowing skin. There’s also Rose Quartz powder in the formulation, which helps to reduce the appearance of fine lines, wrinkles and redness while illuminating the skin with its light-reflective crystals. And, when you’ve hit pan - this palette can be fully recycled, which is the first in the industry. The eyeshadow pans and elastic are removable and the FSC certified paper palette is fully recyclable. We also printed the palette and outside packaging with water-based soy ink so that it is actually be recycled once it’s in the recycling system..there is so much to think about when you want to make a product that is truly recyclable! The Sunday Issue: You put a lot of thought into the name, the concept and the ingredients. Natural, organic and sustainable are words we hear a lot lately, especially in the beauty space. Can you help explain what this means? Tiila Abbitt: Āether Beauty is a sustainable beauty brand. That means each ingredient is vetted to ensure it is clean and nontoxic but also sustainable in practices. Natural and naturally derived means that natural ingredients are used or the ingredient was created from an originally natural ingredient. Organic means the ingredient was farmed using USDA organic practices. I actually believe you can marry the best of both worlds by using both natural and non-toxic synthetic ingredients. People tend to assume that natural must mean that it’s better for you. However, there are many naturally occurring substances that you would never want in your beauty products, like asbestos and lead. Most people also don’t know that mica is directly linked to child labor. 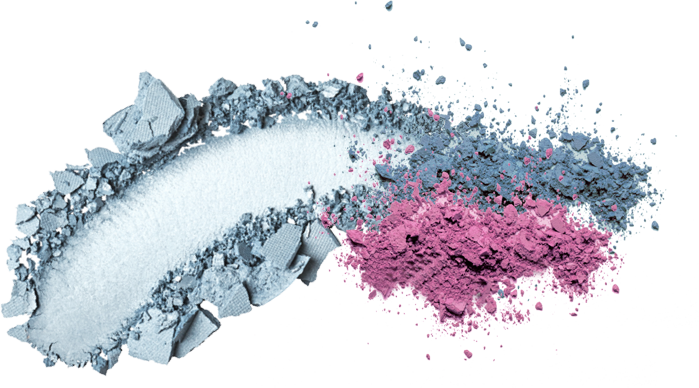 However, most natural brands use mica in almost every powder product. I actually use synthetic mica when I cannot vet the origin of child-labor free mica. Synthetic mica is even more expensive than mica, but it is cleaner and not grown amongst other natural minerals that can naturally be found mingled in it: like manganese, aluminum and lead. Āether Beauty also uses organic ingredients and fair-trade ingredients whenever possible. And, we follow the European guidelines for ingredients, which means not using any of the 1,300 EU banned chemicals versus the only 11 banned chemicals in the United States. (Editor’s Note: You can find more out about Āether’s ingredients on their webpage). The Sunday Issue: The organic/non-toxic/vegan beauty space has changed the industry with retailers like Credo and CAP Beauty becoming part of people’s everyday beauty vernacular. Why do you think it took until this moment to get the consumer’s attention? Tiila Abbitt: Every trend takes time. From a macro-level, I do think people are more and more concerned about the overall state of our planet and are becoming more and more aware of ingredients in our food. Beauty and cleaning product categories tend to always follows suit. I think with food it is much easier to understand. When you read a food label, if there are ingredients you recognize then you are usually buying something natural, that has not been processed or you can at least understand what is in the food your are purchasing. However, you basically have to be a chemist in order to decipher a makeup labels’ INCI, which stands for International Nomenclature of Cosmetic Ingredients (i.e. the ingredient deck list), so people are relying on these retailers that has street cred in the space and trust them to vet the products they put in their stores. And these retailers are doing great work, forging the way and creating more awareness for the clean beauty space. The Sunday Issue: Āether Beauty is not only about “clean’ ingredients but is also about environmental responsibility and sustainability. Tiila Abbitt: Yes, it is. No brand in the makeup category has truly 100% sustainable packaging. All the plastic components you see out there end up in the landfill since they are mixed with other materials: screws, mirrors, other plastics, etc., which makes the package unable to be recycled. Even brands using paper components - like a paper lipstick for example - is paper wrapped plastic, so not only are you still using plastic, but you are using more materials by wrapping it in paper. Or even some brands whose products are refillable. A lot of their main componentry actually isn’t recyclable either, even if you use it for a long time. But brands are trying to be more sustainable in their packaging, and that’s great. Like choosing glass over plastic for a foundation bottle, the only problem is then the cap and the pump aren’t recyclable. I’m trying to change that. I will not launch a product without using recycled materials and making sure it is completely recyclable. The Sunday Issue: That is truly astonishing - here I often buy things that seem recyclable and it turns out they are just sitting in landfills. Let’s talk about brushes because there has been a cruelty-free movement for brands to switch out animal hair for synthetic bristles but that is concerning, too, correct? Tiila Abbitt: You would think with my history of creating one of the largest brands in makeup brushes I would create makeup brushes for Āether Beauty. However, there is no way to recycle a brush. The trend right now is with vegan makeup brushes but that just means we are using more and more virgin plastic and with 8.3 billion tonnes of plastic already on the planet, I have no interest in creating anymore. And it’s just an end cycle; they stay in landfills forever, even if you keep that brush for 20 years, it will eventually end up in a landfill at some point. I just can’t do it from a sustainable viewpoint or be okay leaving the planet knowing I’ve added to it’s pile of plastic that will never go away. The Sunday Issues: Āether Beauty is a self-funded beauty startup. What other brands or entrepreneurs inspire you? Tiila Abbitt: From a branding perspective, I mean, everyone’s a huge fan of Glossier’s model. There is no retailer, product direction comes directly from the customers letting them lead plus vet the product development, AND they have a huge cult following. I mean, Emily Weiss is definitely a genius. Plus her branding is completely onpoint and connects directly with her target audience. From a sustainability space, Reformation is a clothing brand that is trying to change how the clothing industry looks at its own footprint and leads the way to doing it better. I actually think this is the way of the future and will hopefully be the industry standard for all product industries in the (hopefully) near future. The Sunday Issues: Are there any other beauty brands or products you love and recommend we try? The Sunday Issues: It takes vision and bravery to start your own company. What is it like working for yourself? Tiila Abbitt: I have always been an entrepreneur at heart. Ever since I was a little girl, I would make stuff and sell it outside my dad’s dentist office. I knew at some point I would venture off on my own, but I never thought it would ever be in the beauty space. I actually thought it would be in food or children’s products, some of my other passions. I don’t know how brave this actually is; more like possibly a little crazy….especially considering how much I loved my job at Sephora, but it was just more a gut instinct that said, “this is the time, no one else is doing this.” I saw an opportunity and literally the ideas came (and still come) flowing out of me. It’s much easier that I thought it would be. However, working in beauty and especially collaborations- with other companies and brands- it makes you understand how to work fast and be decisive, especially with other teams that can work quite differently. So that education has helped me tremendously. The Sunday Issues: I am not a mother but a lot of of our readers are and the most universal thing I hear from them is how difficult it is to maintain work/life balance when you have others who are dependent on you. How do you find this equilibrium now that you are a brand founder? Tiila Abbitt: This one is tough. I have a 5-year old daughter and a 2-year old son. My daughter’s in preschool, but my son is home with me and he doesn’t quite understand, “Mama has a phone call,” or “Mama has work to do.” But, we have an au pair and she takes care of him during the day, so there are much fewer interruptions, although I have come to love them since they are so innocent. He tends to come in my office and say “Mama, no work,” and if I can spare five minutes to play or read to him, I do. That’s the beauty of working from home. The downside is, it’s hard to turn off at the end of the day after the kids are in bed. The computer is so tempting to open and being at home seven days a week, work sometimes never closes…but it is satisfying since it’s for my vision for Āether Beauty. The Sunday Issues: You juggle so many roles right now: Brand Founder, Product Developer, Merchant, Account Manager, Creative Director, etc). Which role did you enjoy the most? Tiila Abbitt: All the creative pieces flew out of me, but because this was a space I’d never been before, I had too many ideas. It was much harder to simplify and not bounce ideas off a team. So I went in a few different directions at first but ultimately came to a clear vision which I am proud to stand behind. 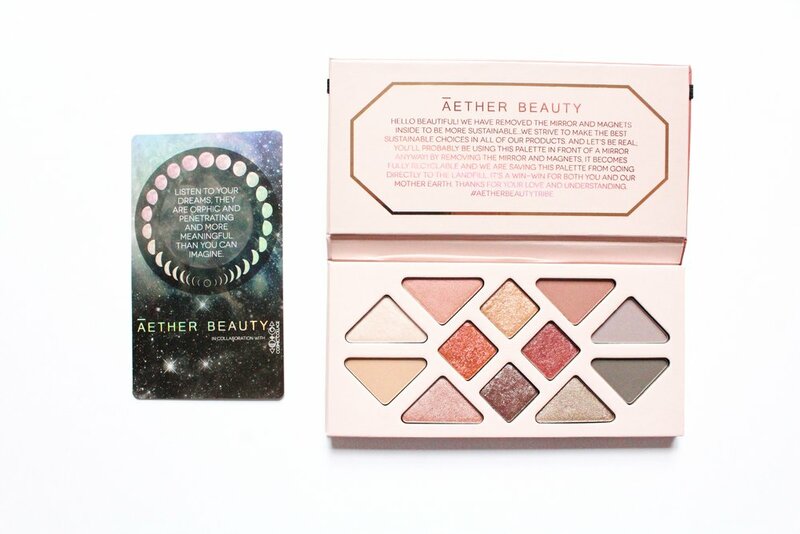 The Āether Beauty Rose Quartz Crystal Gemstone Palette ($58) is available at aetherbeautyco.com.